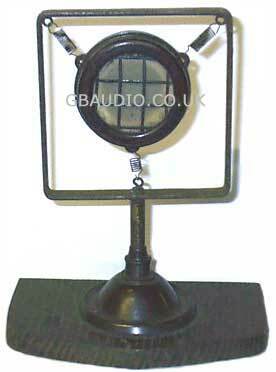 An iconic vintage mic with bakelite body. Spring mounted in a steel frame mount and short table stand with wooden base. This mic is believed to have been made in the 1930s. We understand that carbon granule microphones had an extremely low output sensitivity and therefore required a special preamplifier before the amplifier mic input. We would be very pleased to her from you if you can help us with any further information about this microphone.